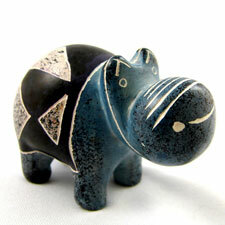 A hand carved and colorfully painted soapstone hippo makes a fun gift item for any hippo fan on your gift-giving list. He is cool and smooth to the touch and will happily keep you company at your desk or will bring a smile to your face each time you pass his display shelf. Hand carved in Western Kenya, these stylized hippos come in beautiful colors with African design motifs across their broad backs and sides. These hippos were produced under the Fair Trade Movement where artisans are paid a fair price in advance for their products and work in safe working conditions. Fair Trade provides the framework for empowering the disadvantaged of the world to make a fair living and provide for themselves and their families. Hippos measure about 2 1/2" long. Soapstone tends to be fragile but chips can be smoothed with water and sandpaper. Colors vary - we will choose for you.